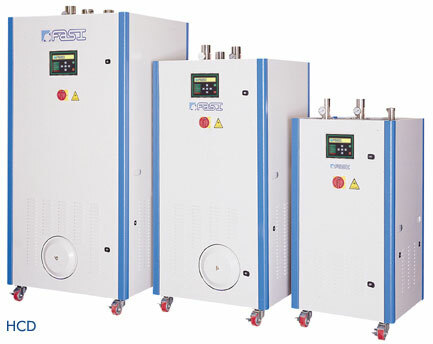 HCD Series of Honeycomb Dehumidifiers have been designed built using the ¨Rotor Honeycomb¨ principle, and operate in a closed loop system with the dew-point of -40oC. The Honeycomb rotor is divided into a process and regeneration zones by the casing structure and heat resistance air sealing. The rotor is constantly and very slowly rotated at an optimum rotation speed for the condition by a gear motor. 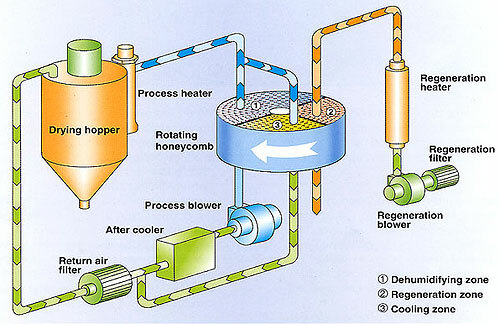 High moisture air is drawn into the honeycomb matrix of the rotor througth the return air filter by the process blower. When the air is passing through the honeycomb matrix, moisture in the air is adsorbed and dried air is discharged from the process outlet by the process blower. The rotor adsorbed moisture is rotated into the dehumidifying zone before it is saturated. At the same time, the cooling air is drawn from the counter side through the regeneration filter and is heated and enters the regeneration zone of the rotor and disturbs the moisture adsorbed in the rotor and then is exhausted to the outside by a regeneration blower. This cycle of operation is continuously conducted. Note: (1) In an independent drying hopper. (2) Based on relative humidity 65% with ambient temperature of 20oC, moisture content after drying can be 0.005% or less.